Ultra-Modern Chic, a 20 minutos do centro de Denver! Oportunidade rara! Junho e agosto ainda estão disponíveis! Esta casa ensolarada de um nível, perfeita para até seis hóspedes adultos, está mobilada com tudo o que você precisa para aproveitar a sua visita à região de Denver - três quartos com camas king ou queen-size premium, casas de banho recentemente renovadas com luminárias reluzentes cozinha do chef com armários de bambu e alumínio, fogão a gás Viking e barraca de açougueiro, LR com tela plana / TV a cabo, ipod player, Internet sem fio de alta velocidade, lavadora e secadora de tamanho completo, escritório doméstico totalmente abastecido com impressora e home ginásio com Precor elíptico, sistema de segurança e aquecimento central e ar condicionado. Quintal ajardinado com varanda confortável e churrasqueira de alta qualidade. Um carro na garagem. Localizado no Harris Park, um bairro histórico e distrito de artes designado - Caminhe para teatro da comunidade, fest jazz local, festival da colheita da maçã, galerias de arte, deli italiana autêntica, padaria e café! Um fácil passeio de bicicleta de uma milha para nadar centro de vizinhança e ótimos restaurantes locais. Perto de acesso à rodovia para destinos de esqui de montanha via I-70 (1. 5 horas para áreas de esqui.) Distância ao bairro Highlands do Norte de Denver, (10 minutos), Downtown Denver, (20 minutos), Broomfield, (15 minutos) e Boulder, (30 minutos). Westminster Commuter Station localizado a uma milha da casa leva os hóspedes seis quilômetros de trem para Union Station e centro de Denver, ou transferir para a linha do aeroporto para pegar um vôo! I would give more stars if I could. This house was the best VRBO home we have ever stayed in. The owner, Jessica, takes great care to make sure guests are happy. First, it is spotless. Fully stocked with cleaning and cooking supplies saved us time shopping and money on supplies we would usually need to buy. The kitchen is a chef's kitchen with every appliance and kitchen tools one could want. We cooked a holiday dinner for family, all the cookware we needed was available. There is a lovely fenced in back yard. The house has an office fully equipped with printer, paper, envelopes, pencils, etc.. Bedrooms have plenty of closet space, bathrooms have lots of storage. Thank you Jessica, we all loved the house. Thanks so much for taking the time to write such a lovely review! I am delighted to hear that you were comfortable and found the house well-provisioned for your stay. I feel like with the new slipcovered furniture and cleaning the large area rug between guests, the house is very clean and it’s so nice to hear that you felt that way too! It was lovely to meet you all. Come back again any time! This property was perfect for us! Jessica had everything we needed for our toddler already at the house, and the house was very clean and well maintained. Definitely recommending this to friends visiting Denver. We stayed at this home for the week of our family’s Thanksgiving gathering (3 adults and 3 teens). It is a beautifully remodeled home in an older neighborhood. It’s a perfect location between Denver and Boulder, which was great for us because we had to travel between both during the week. The kitchen is well-equipped with everything you’ll need to cook any meal and Jessica is a fabulous owner who is easily accessible and pays attention to every detail! Great home in quiet neighborhood! We had a wonderful experience in this home. The owner was kind enough to allow our small dogs, which on its own was awesome let alone the fact that she took time to ensure they were safe in the backyard and then checked in during the week to make sure they were comfortable. Our dogs are our lives so that just meant the world to us. The house itself is clean, modern and comfortable. Everything you could possibly need for a great vacation stay is there. I had to work during our stay and there’s even a great office area stocked with everything I needed. 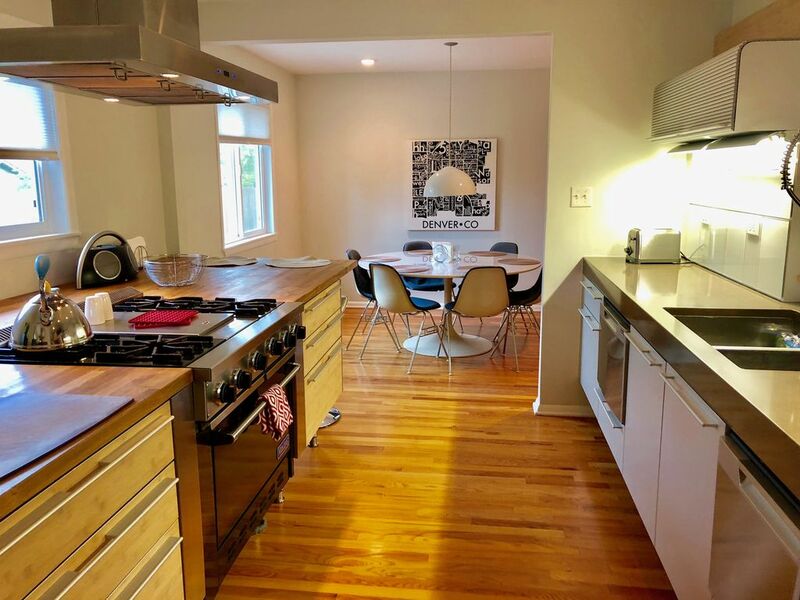 Overall, if you want a comfortable, modern and well appointed vacation home in a classic Denver metro neighborhood close to everything, then I cannot recommend this house more. And with the attention to detail and genuine care for your comfort that the owner provides, you can’t beat it! Thanks so much for taking the time to write such a lovely review. Please come back anytime and thanks for taking such great care of my home:) I only wish I had been able to meet Barney, Walter and Gladys while you were staying; they are the cutest! Immaculately clean, beautifully and comfortabley furnished. Close to Boulder and Denver. Loved our stay. Owner Jessica was great. Home is immaculate and well furnished. Just beautiful. Exceptionally clean, bright, open. We loved staying in Jessica's house. Owner has done everything possible to make a stay in this home a happy experience. Drop-dead gorgeous and functional kitchen. Extraordinarily comfy beds. Clean and light-filled. Small well-organized backyard. Jessica was quickly responsive to any question we had. Will stay again. Thank you Jessica! Thanks so much for taking the time to write such a lovely review. You're welcome back anytime! $200 Pet Fee; 1-2 adult dogs, and all dogs must be approved in advance by owner. I cannot allow cats as the owner is allergic to them. Refund Policy: no refunds. Rates are subject to change until a reservation is paid and scheduled. Holiday and event weeks are priced at a higher rate. There is a week minimum stay for all holiday and event weeks.